Feeding Scorpions - What's the go? 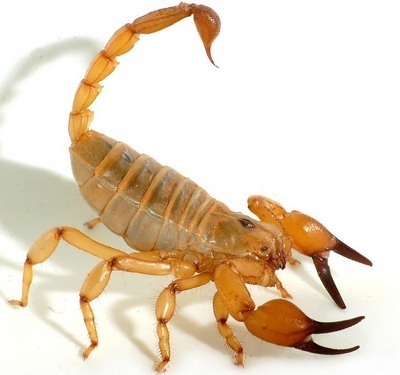 Scorpions as Pets - Good or Bad idea? 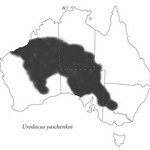 Description: A member of the endemic Australian Urodacidae family, whose closest relatives include members of the Scorpionidae inc., Heterometrus, Opisthophthalmus, and Pandinus. Chelicera show many secondary serrations. Vesicle large, rarely of moderate size. Tarsal claws unequal, especially the last 2 pairs of legs. Colour usually a reddish yellow/orange - brown, often with a darker mid-dorsal vertebral stripe, dark reddish-brown fingers and leg joints. Underside is pale, almost white. Carapace with frontal notch variable, slight to deep, frontal lobes truncate. Interocular areas coarsely denticulate. Lateral and posterior 2/3 of carapace smooth. Triangular depression deep. Tail moderately long in male, short in female. 5th tail segment significantly longer in adult males. Aculeus short to moderately short, moderately to strongly curved. Hand wide as adult, moderately narrow as juvenile and moderately flat, sometimes rounded. Fingers moderately long to long, moderately to strongly curved. Pectinal teeth in male 15-29, female 8-20, depended on geographic location. 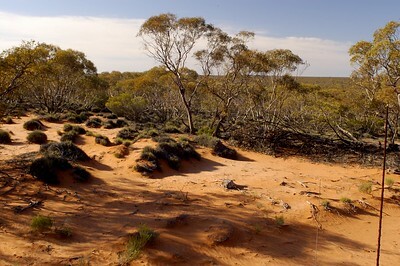 This species constructs deep spiraling burrows in loose sandy soils across Australia’s arid interior, sometimes up to 2 metres deep in the driest environments. They prefer to burrow in open sandy areas, usually away from leaf litter and tree debris, however if under trees, they are usually late instar to adult age. A sit and wait predator utilising the burrow entrance as a trap by keeping the very steep entrance clear of debris as a daily maintenance procedure, in a similar fashion to a spider repeatedly repairing its orb web. They rarely ever wander, and if one does, it will most likely be a male during mating season. A prolific species found in high densities; research has shown 400 animals in 2240 m2. Unlike rock dwelling species there is little to no competition for home space and with insectivorous marsupial losses and extinction they have reduced numbers of predators. It's unknown if these scorpions were in such high densities before the European invasion, one can only speculate, but I suspect for reasons stated, densities today may be unnaturally high. They are most vulnerable during dispersal from the home burrow, during burrow maintenance and as adult males wandering to find a partner. This psammophile (sand lover) has developed specific morphologies as a result of its adaptation to a sandy environment. 1) Sand combs. 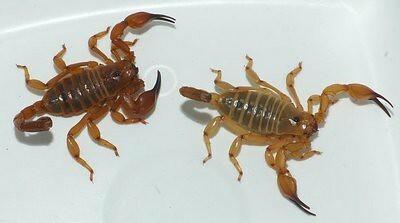 While the scorpion walks backwards up its burrow, the front 2 pairs of legs are held across the body forming a sand wall with specialised setae, while the rear pairs of legs pull the scorpion out. Sand accumulates against the specialised setae that adorn the lower leg segments, from the patella down. 2) Disparate tarsal claw lengths. The tarsal claws are quite unusual in this species with one claw getting longer and one shorter from foot I-IV. On foot I, the claws are almost the same length, foot II, one is slightly longer and the other slightly shorter, finally foot IV has one very long claw and one virtually non-existent. This is thought to aid in gaining traction in loose sandy soils. See, an Apomorphic Character State. This species does not drink liquid water, instead it removes water from soil by osmosis, this is considered to be in response to the lack of liquid water in the environment it occupies. I have demonstrated experimentally that this species takes water from the soil it occupies at a minimum content of ~1.5% by weight. This corresponds to a negative tension of about 550kPa in soils tested. 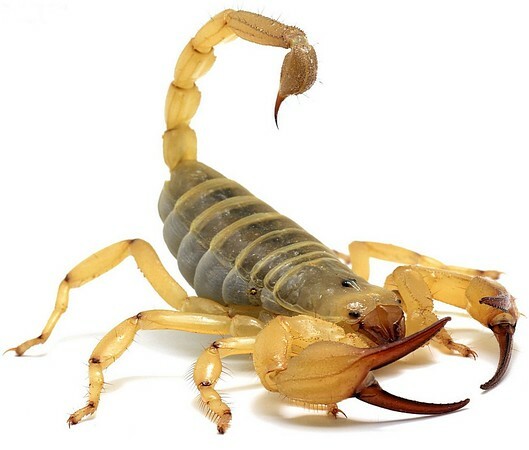 In the wild, this scorpion digs burrows deep enough to reach a soil moisture content of 1.5%, and as a result it digs deeper burrows in areas of lower rainfall. I have also witnessed them sitting on low vegetation after and during rain, presumably taking water up by osmosis. It is considered this may occur through slit sensilla located on the feet and legs. As mentioned, this scorpion is a fossorial obligate burrower, digging deep tortuously spiraling burrows in loose dune sands. The term 'fossorial' ordinarily refers to those animals that live and forage exclusively underground, but as this scorpion is so close to that, I have chosen this word in order to differentiate it from burrowing scrape dwellers, the latter I term semi-fossorial. I have taken many lead and plaster casts of their burrows and recognised an age-related pattern in burrow structure. Each instar will create the 3 sections of the burrow, entrance chamber, spiral section and terminal chamber - See Burrow Structure. Young instars produce a very long entrance chamber, at about 30 deg’s to ground level, followed by very neat and tight spirals in a spiral stair-case fashion. There is a big jump at 3rd instar in relation to the spiral section, it spreads out vertically compared to its very small, tight 2nd instar cohort. As the animal ages the entrance chamber shortens, to the point that adults have a very short entrance chamber leading directly into the spiral section. There have been various ideas put forward, but personally I feel the spiral section controls the loss of water vapour from the burrow, enabling this scorpion to keep its burrow open for most of the year, meaning it can feed over a longer period, which might account for its relatively large size compared to other smaller species living syntopically that are more seasonal feeders. Number of offspring: unknown, but in line with similar size Urodacus, likely 12-40. This species follows an annual pattern of ecdysis and reproduction - personal observation, also see Shorthouse and Marples (1980). Mating takes place in spring (Sept-Oct), young are born ~18 months later in autumn (March-April). It is unknown how many young are produced as they have never been seen in the wild or in captivity. In captivity gravid females always resorb their young; they are a very fussy species with respect to conditions. Most Urodacids produce from 12-40 young. Given the size of this species I would expect an average of 25. Dispersal is to the immediate area surrounding mum, shown by large numbers of congregated young appearing in groups over autumn. Ecdysis takes place throughout the warmer months, this is readily recognised by blocked burrows and the appearance of fresh looking instars. Birthing also presumably takes place with the burrow blocked. During winter months, most will block off the burrow, but some will remain active, even appearing at the entrance during daylight hours. Each instar undergoes ecdysis only once per year, with the exception of course of the 1st-2nd instar phase. Adulthood is reached at the 6th instar stage. Scorpions, probably more than most organisms are highly sensitive to environmental water. Existing in an environment with very low rainfall means the need to conserve and access water when needed is crucial to survival. 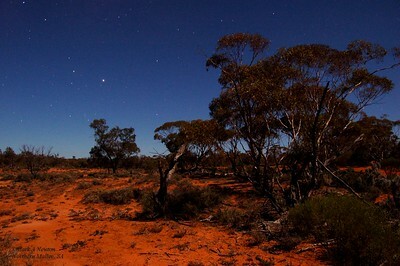 Australia’s fauna has a mesic history, having evolved and radiated largely during a period when temperatures were lower and rainfall was higher. Urodacus yaschenkoi might occupy one of the harshest environments on the planet, but it has done so by taking its mesic origins with it. 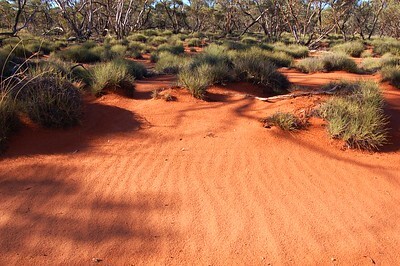 Living inside a burrow which experiences mild temperatures with little climatic swing (see subterranean burrow temperatures), largely emulates Australia’s mesic past and so this animal has maintained much of its early physiology, adapting to the changed environment by the way in which it lives. In contrast, the most obvious physiological change has been the ability to draw water from soil via osmosis, otherwise this animal is quite vulnerable. Why vulnerable? For a desert adapted species this scorpion shows very high evaporative water loss via its cuticle, most likely in response to a lack of surface activity and the ease with which it can take water from substrate. At only 50% RH this animal will lose about 1.5% of its body mass daily and death normally occurs at around 20% overall loss. It doesn’t take much water to saturate a small volume and the 1.5% by weight soil water content is more than enough to keep the scorpion’s semi-sealed subterranean burrow at a very high humidity - above 90% RH or more. It seems like a contradiction, a desert animal living in an atmosphere with such high water content – but this is the case. Locket, N. A. (1986). Albinism and Eye Structure in an Australian Scorpion, Urodacus yaschenkoi (Scorpiones, Scorpionidae). The Journal of Arachnology, 14(1), 101-115. Shorthouse, D.J. & Marples, T.G. (1980). Observations on the Burrow and Associated Behaviour of the Arid-Zone Scorpion Urodacus yaschenkoi (Birula). Australian Journal of Zoology 28 (4): 581–90.